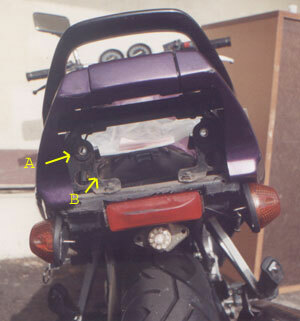 Replacing the stock rectangular taillight on 89-00 gs500's with an R1 or FZ1 taillight lens is super easy. The R1 taillight bolts right in to A below. I'd consider moving the bracket to make it sit deeper in, but I think it looks good where it is, and i don't want to impinge on under seat space. This is how it fits with practically no modification. I don't know what the stock taillight is like, but to get at the bulbs on the R1 taillight you go under the seat and pull them out from the front. 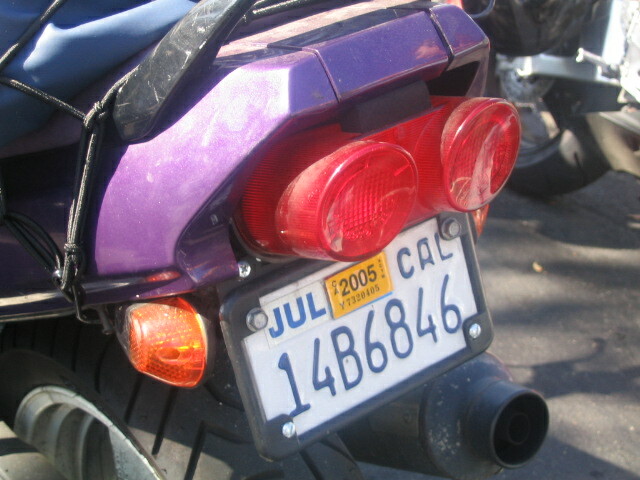 The sockets that the bulbs sit in plug into the taillight housing. These sockets have two ears to let you twist them into place. In order to make them clear B, I had to cut one ear off each. For whatever reason, when I first installed the new taillight, it was tilted down slightly. I folded up some thin cardboard to shim up the bottom.